The “How To Be A Back End Specialist” course is your road-map to a thriving “Back End” marketing consultancy business (a.k.a. marketing/funnel automation). This course teaches you the operational, sales and administrative requirements of your business. You will learn how to setup your business, how to acquire recurring monthly clients, which services to offer, how to price them and much, much, more. This is a proven system and competition is almost nonexistent. So let’s get started on the journey together! Note: These sessions were recorded as part of a monthly membership program (now closed) that included BEST certification, Back End Blueprint, SalesCPR and other benefits as part of the program. 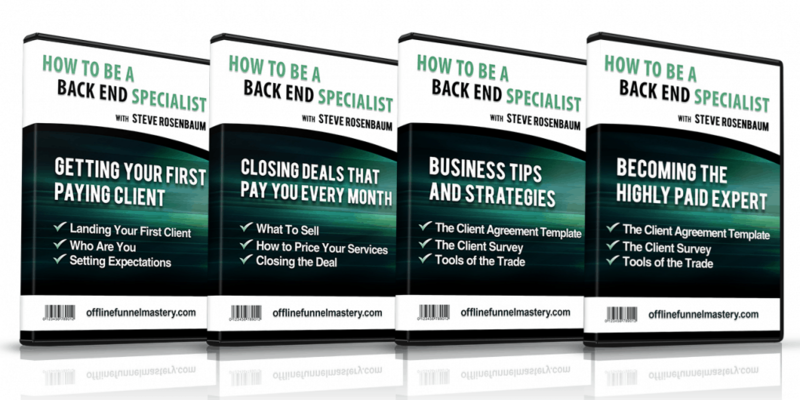 While you may hear mention of these in the recordings, they are not included as part of the “How To Be A Back End Specialist” course. You will find everything that is included in the course linked to this course and lesson pages. Plus, we will provide discount links to other products as a bonus for your investment. Those wishing to advance their Back End training and skills should join the “Offline Funnel Mastery” group.